Game-Changing Patents in the World's Hottest Market! This industry has gotten the attention of Elon Musk, Richard Branson, and Google founder Larry Page – they all believe this is the future of energy storage! Through extensive research, I’ve been able to dig through the financial presentations of 231 technology companies, and, without a doubt, nanotechnology is the most cutting-edge sector of all. The future of nanotechnology is abundant, and many smart investors are taking a look at disruptive technologies that are being developed as we speak. This is the time to sink your teeth into this explosive sector and make sure you know exactly how to play this. 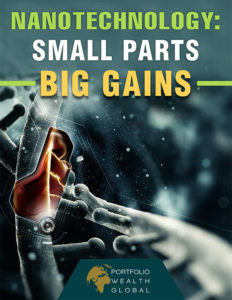 Download Nanotechnology: Small Parts, Big Gains Now!